You are here: Home / Blog / API 5L Pipes / Types Of API 5L Pipes? Types Of API 5L Pipes? What are the Types Of API 5L Pipes? When authoring the standards, the technical committee recognized that there are two basic Product Specifications Levels (PSL) of technical requirements and therefore developed PSL 1 and PSL 2. PSL-1 is a loose standard quality for line pipe. PSL 1 Pipes are used to distribute line pipes. Grades covered by this specification are A25, A, B and “X” Grades API 5L X42 PSL1 Pipes, API 5L X46 PSL1 Pipes, API 5L X52 PSL1 Pipes, API 5L X56 PSL1 Pipes, API 5L X60 PSL1 Pipes, API 5L X65 PSL1 Pipes, API 5L X70 PSL1 Pipes, API 5L X80 PSL1 Pipes. The two digit number following the “X” indicates the Minimum Yield Strength (in 000′s psi) of pipe produced to this grade. PSL-2 contains additional testing requirement, stricter chemical physicals, along with different ceiling limits of mechanical properties, and require Charpy impact testing conditions. Furthermore, additional testing requirements under PSL-2 include CVN testing, non-destructive inspection of seamless products, certification to SR15, and mandatory traceability throughout the entire production process. Most FERC, DOT, or FEMSA lines require PSL-2, meaning these types of requirements are a must when supplying pipe for pipelines that are regulated by any of these governing bodies. PSL2 pipes are more used for natural gas pipe or crude oil line pipe where there are high requirements for pipe pressure, pipe anti-corrosin ability, high mechanical strength etc. 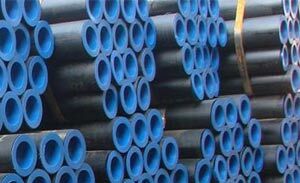 Grades covered by this specification are A25, A, B and “X” Grades API 5L X42 PSL2 Pipes, API 5L X46 PSL2 Pipes, API 5L X52 PSL2 Pipes, API 5L X56 PSL2 Pipes, API 5L X60 PSL2 Pipes,API 5L X65 PSL2 Pipes, API 5L X70 PSL2 Pipes, API 5L X80 PSL2 Pipes. The two digit number following the “X” indicates the Minimum Yield Strength (in 000′s psi) of pipe produced to this grade. Grades covered by this specification are A25, A, B and “X” Grades API 5L X42 LSAW Pipes, API 5L X46 LSAW Pipes, API 5L X52 LSAW Pipes, API 5L X56 LSAW Pipes, API 5L X60 LSAW Pipes,API 5L X65 LSAW Pipes, API 5L X70 LSAW Pipes, API 5L X80 LSAW Pipes. The two digit number following the “X” indicates the Minimum Yield Strength (in 000′s psi) of pipe produced to this grade. Grades covered by this specification are A25, A, B and “X” Grades API 5L X42 DSAW Pipes, API 5L X46 DSAW Pipes, API 5L X52 DSAW Pipes, API 5L X56 DSAW Pipes, API 5L X60 DSAW Pipes,API 5L X65 DSAW Pipes, API 5L X70 DSAW Pipes, API 5L X80 DSAW Pipes. The two digit number following the “X” indicates the Minimum Yield Strength (in 000′s psi) of pipe produced to this grade. Grades covered by this specification are A25, A, B and “X” Grades API 5L X42 Seamless Pipes, API 5L X46 Seamless Pipes, API 5L X52 Seamless Pipes, API 5L X56 Seamless Pipes, API 5L X60 Seamless Pipes,API 5L X65 Seamless Pipes, API 5L X70 Seamless Pipes, API 5L X80 Seamless Pipes. The two digit number following the “X” indicates the Minimum Yield Strength (in 000′s psi) of pipe produced to this grade.